I have to Google to find a good explanation on what is songket. Songket is a type of hand-woven traditional Malay fabric with gold and silver threads and worn mainly during official functions and ceremonies. I am fortunate to know someone whose family business is songket weaving. She decided to go further and make use of the songket the business has and innovate it to something that more practical and widely used in Malay wedding business. 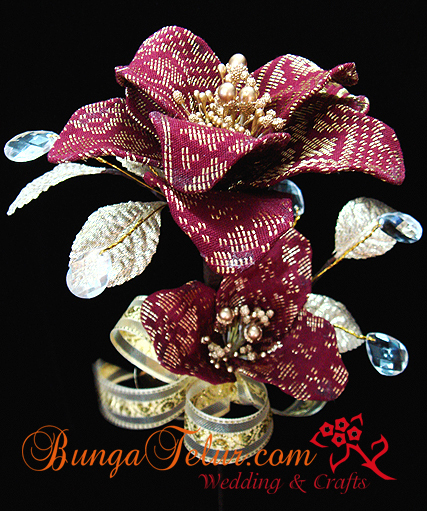 We came out with this idea of bunga pahar using songket fabric crafted into the flower petals. If you read my previous entry, in Malay wedding, bunga pahar are given to guests as souvenirs. So there are actually many designs of bunga pahar flower, some made from nylon, dip solution, beads, ribbons, organza and satin, just as much one’s creativity can stretch to. So here is the songket bunga pahar recently made. Apart from this I also created corsages and bigger stalk of flowers to decorate hantaran using songket. Some of the samples were published in Vol.3 – Ratu Sehari – bridal magazine sold in Malaysia. Of course it doesn’t go under my brand since my friend is the one who pay for the advertisement..haha! Very creative!!! Looking forward for more new creative ideas from you. Bunga dari songket ni yg paling sy suka tgk…satu inovatif baru…. very nice..if i nak order around 100pcs, brapa ek? How much it takes for 100 pcs? ezadora, saya dah emailkan harga. hai… brapa erk harga untk 200pcs…. Boleh saya bertanya berapa satu bantang buga itu? hi, tolong emelkan harga for 100 pcs. tq! hi, bole bgtau harga untuk 100-200pcs tak? tq~ menawan! Berapa harga untuk 20 batang? organza jugak rasanya cantik. ader gambar x? klu boleh saya nak tau harganya. untuk masa terdekat ni boeh x? boleh x saya tahu lokasi kedai/rumah? Look very well defined.. please quot me the price and size. Got any other colour? nak tanya kalau utk 100-200 pcs berapa? Can you please send a quote for 300pcs. please email me quotation for 60 pcs.. thank you. waw..this is so nice..bape harga nya yar? 100pcs? Boleh Tanya harga satu kuntum berapa ? Boleh mail to singapore? Hi…sgt3 menarik…boley order lg x? and brape harge tuk 100 kuntum? Quote me price for 100pcs. Thank you.